Talking about AB testing tools to the readers of this blog may be like preaching to the choir. But if you are new to this blog, or new to conversion optimization in general, you may be wondering which AB testing tools you can start using without making a huge investment. Fortunately, there are some AB testing tools out there that are either free or won’t cost you any additional money because you already have them – you just don’t know it yet. In this post, we’re going to look at AB testing tools that you may have had all along and how to use them to optimize different aspects of your marketing strategy for conversions. Since most people will want to do AB testing on their website, we’ll start with the tools you can use here. 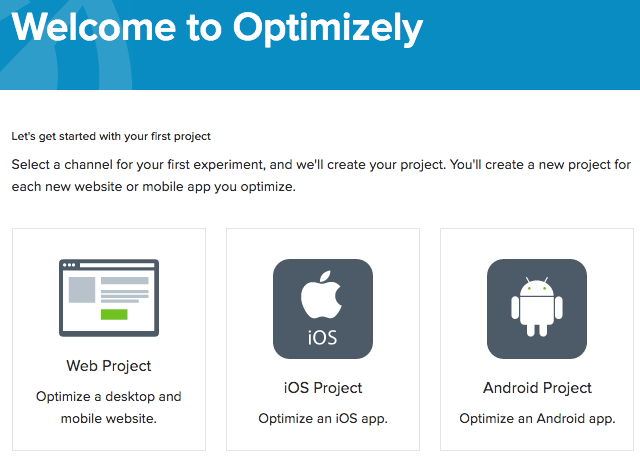 Did you know that if you have fewer than 50,000 unique visitors per month, you can use tools like Optimizely for simple AB testing for free? It’s a really simple tool to use. You just sign up for your free account and start up a website project. Once you’ve entered your URL, you will be taken to a screen where you can immediately start creating a variation to test on your website. Once you’ve created your variation, you click the Start Experiment button and get the code you need to add to your site. 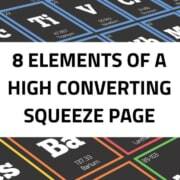 You will set up a goal so you know which variation leads to the most conversions. And then sit back and wait for visitors to come to your website to determine which variation gets the most conversions! If you’re stuck for ideas on what to test on your landing page, you can try the common elements – headlines, subheads, images, calls to action, etc. – as well as some creative options listed in our landing page testing ideas post. 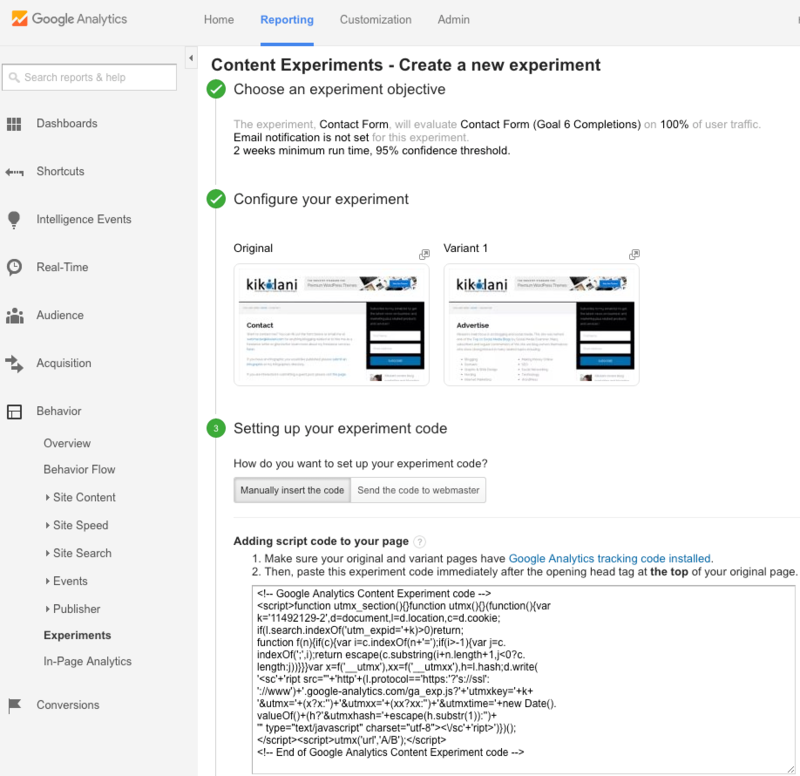 If you have more than 50,000 visitors each month, or would prefer to not add another tool to your toolkit, you can also look into Google Analytics Content Experiments. This allows you to conduct testing with your Google Analytics. To start, you go to Behavior > Experiments for your website and click the Create Experiment button. Then you define the experiment you want to perform, starting with the goal of your test. You will use your Google Analytics goals to ultimately determine which variation of your AB test is the winner. 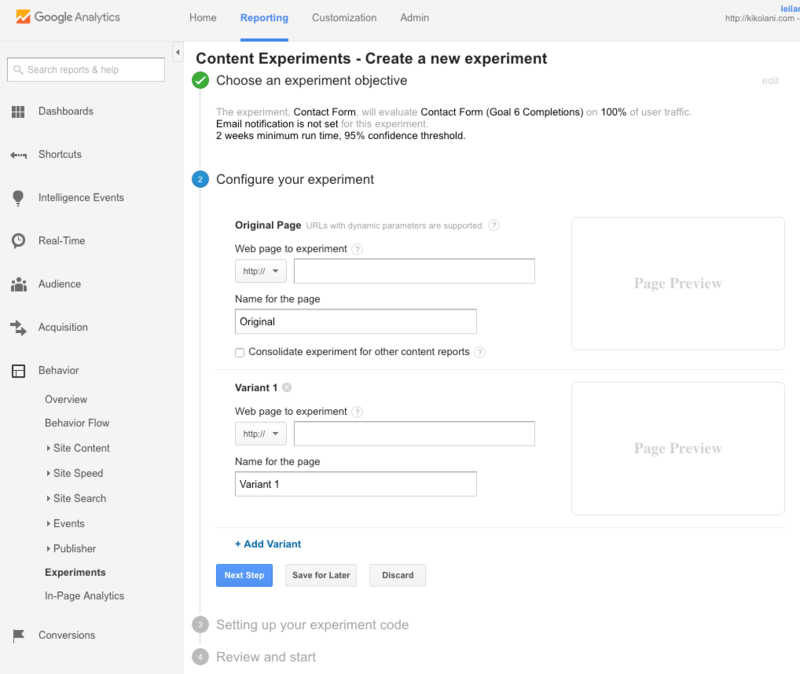 The key difference between Google Content Experiments and your average AB testing tool is that you have to create an additional page on your website that has the variation, whereas most AB testing tools (like Optimizely) will let you “edit” your page in their editor. So depending on what you want to change, it may be an easy or difficult process to create that second page. Setting up variants in Google Analytics may require more steps than using a traditional AB testing tool like Optimizely. 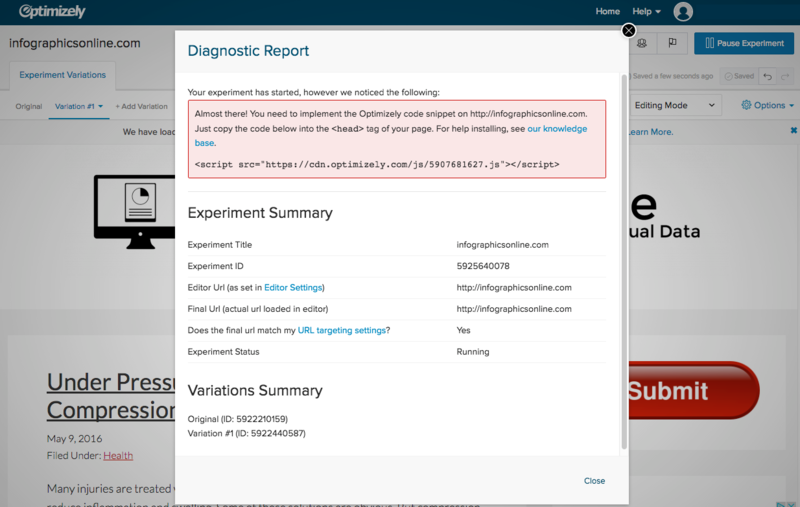 Next, you will receive the code you need to insert on your website to start your experiment. Finally, you will confirm that the code has been installed and you will start your experiment. 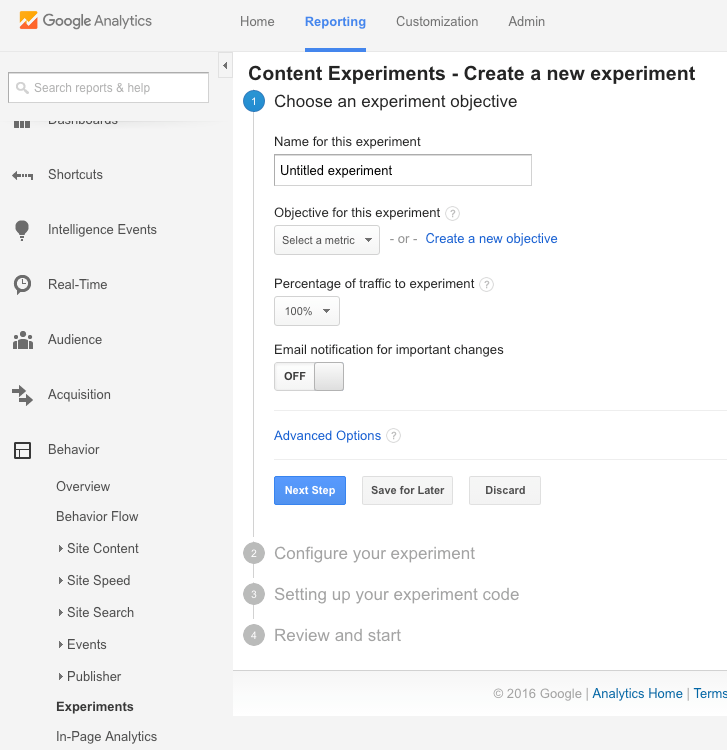 Once your experiment is completed, Google Analytics will declare a definitive winner. An alternative to doing AB testing on your own website is to monitor the tests of others. There’s a free way to do it and a paid way. First, you can try to find your competitor’s website history in the Internet Archives. The downside to the free is that you’ll have a lot of clicking to do. 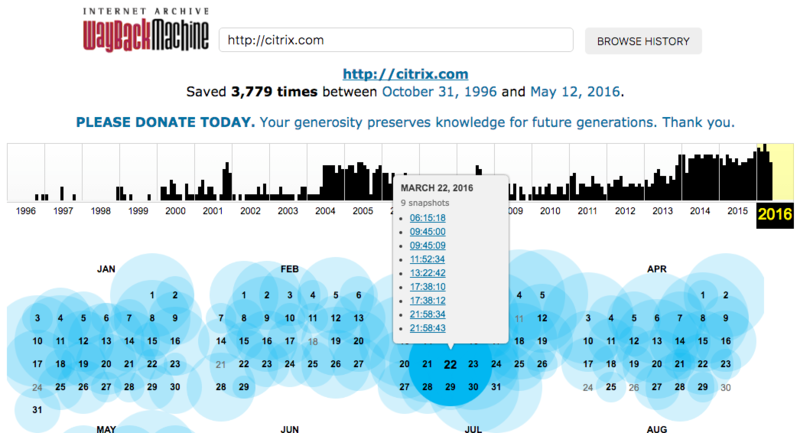 The Internet Archive brings you the tool Wayback Machine which lets you see how a website appeared on a particular date. The other option I mentioned in my landing page testing ideas post, Rival IQ, allows you to see your competitor’s website history in a much easier to digest format. RivalIQ is a paid tool for viewing website histories. There’s a good chance that if you look through your competitors designs over the last couple of years, you’ll see subtle changes to headlines, images, colors, etc. that will relate to some AB testing. So instead of testing on your own, you can learn from their tests and pave your own unique way from there. If you are running email marketing campaigns, chances are you are using a popular email marketing software platform that likely has an AB testing component built in. 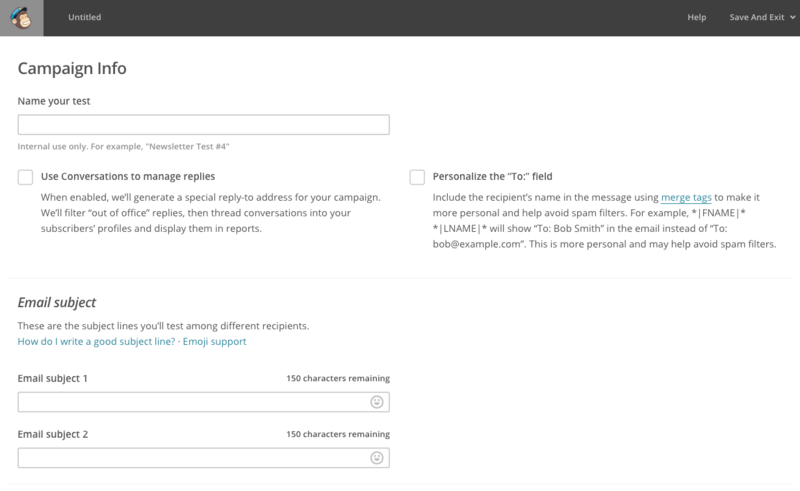 MailChimp, for example, allows you to select an AB testing campaign and then allows you to test four aspects of your email campaign: the subject line (highly recommended), the from name, the content, and the send time. You can choose a certain percentage of your recipients to test with and you can choose click rate, open rate, revenue, or other goals to judge the results of your testing. For example, if you chose to test subject lines, you would simply enter two subject lines for your recipients instead of one. 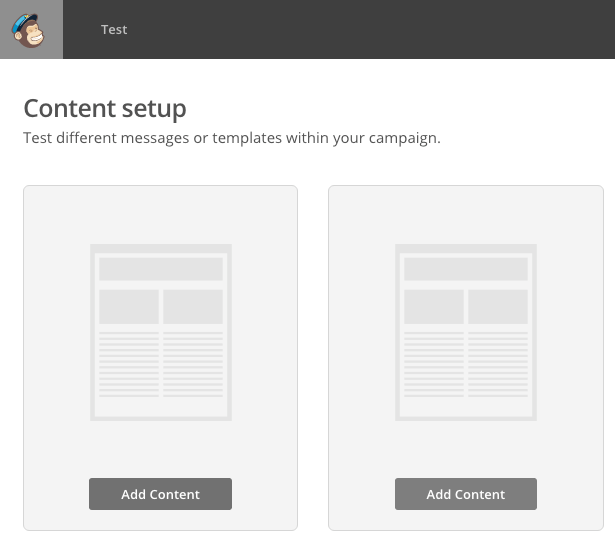 Or, if you were going to test two different types of newsletter content (such as a text-only email versus an HTML newsletter), you would get two email templates to send to your recipients. Most email marketing software offers AB testing. At the bare minimum, you can at least test your subject lines. Some go further with the from name testing, email content testing, send time testing, and other forms of AB testing. But considering that your subject line is the make or break point of whether someone opens your emails, it’s safe to say that so long as you have the option of testing that, you are good! There is a simple and free way to monitor your competition’s email and potentially see what headlines are working for them – just sign up for their emails. And be sure to at least open them. If you just ignore them, some will automate you out of their main line of emails. And that might mean you’ll miss out on some good subject lines! Bonus tip: if your competition is using email marketing software like Infusionsoft, ActiveCampaign, or others that allow automations, you should open the emails and click on the links on occasion. You may get to see one of their automation funnels in action too! Similar to email AB testing, blog content performance can rely heavily on one specific element: the title. If you choose a great blog title, people will click through and read your post from your blog’s homepage, search engines, social networks, and other sources. If you choose a bad blog title, then you may not get an clicks or readers at all. That’s why AB testing your blog post titles can be a crucial key to the success of your content marketing strategy. 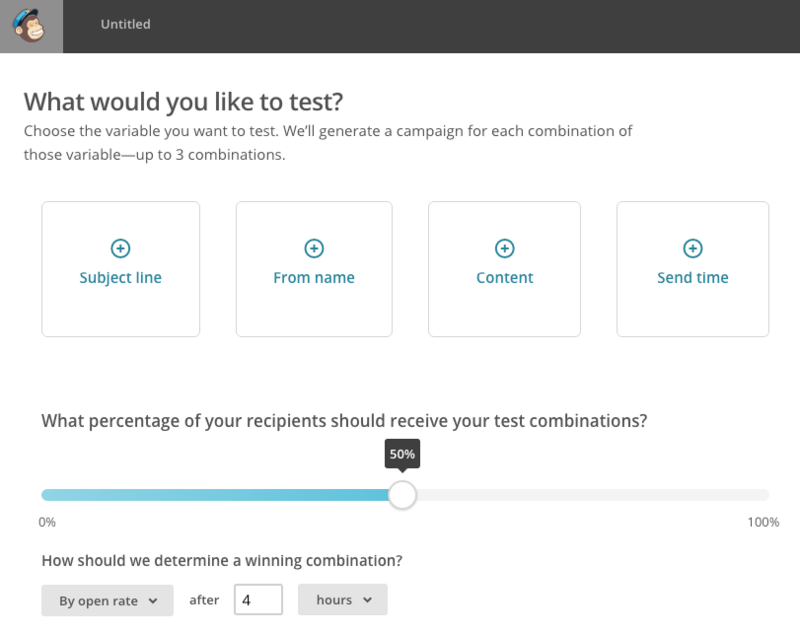 If you have WordPress, Nelio A/B Testing is a tool you can use to do just that. 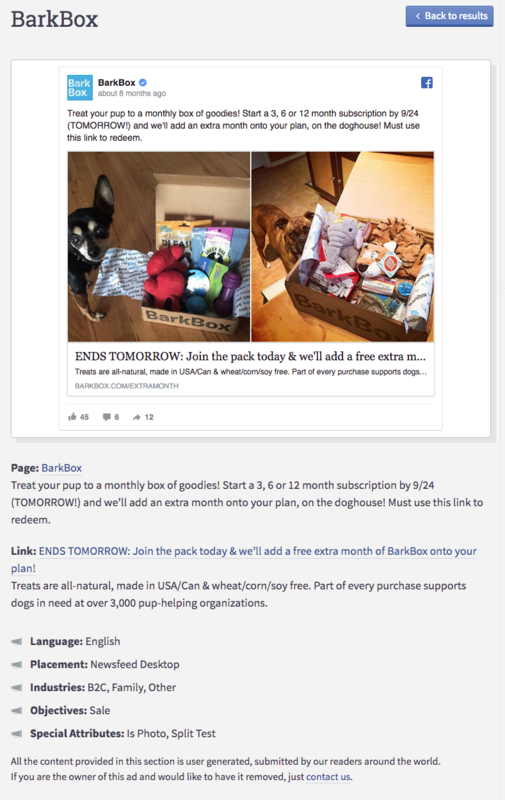 While it’s not free, it starts at $29 a month for websites with 5,000 views per month. And it will allow you to test crucial elements of your blog, beyond just the headlines of your blog posts. 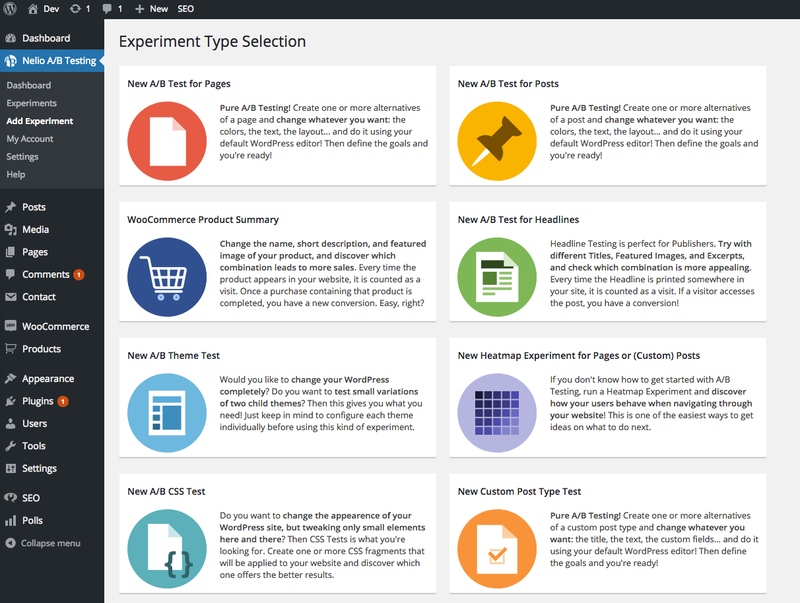 For serious publishers, WordPress website owners, and WooCommerce website site owners, this can be a powerful AB testing tool that can help you test a variety of things that other testing tools simply can’t. Going back specifically to blog headlines, if you don’t want to test your own, there are ways of finding out the best headlines for a specific topic. The free way would be to use BuzzSumo – even without an account, you can usually get the top five to ten headlines about a specific topic based on social sharing. 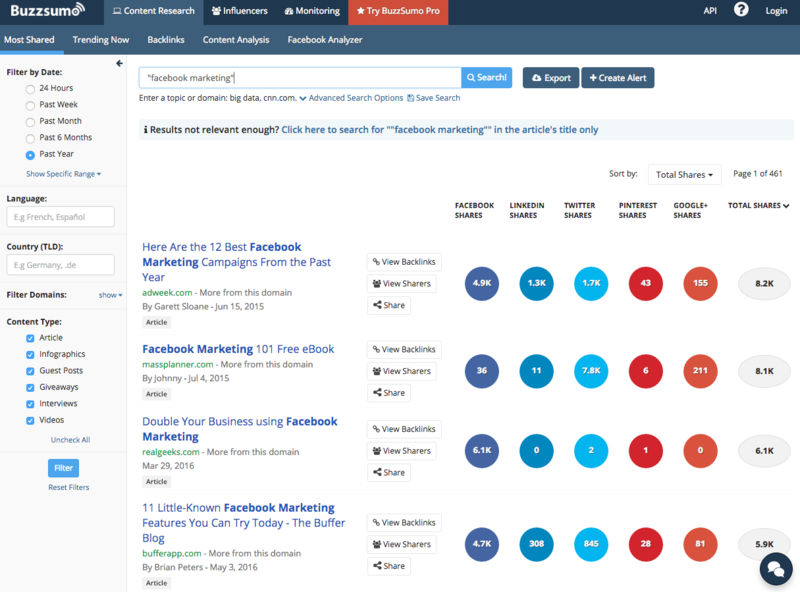 If you don’t mind paying, a similarly priced tool that offers even more information that you can try or compare to BuzzSumo is Impactana. 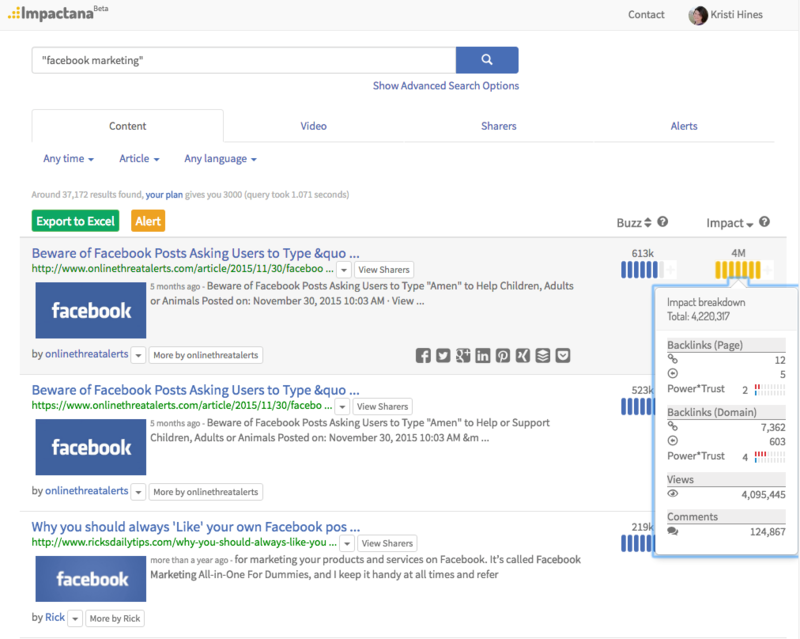 Both start at $99 per month, but Impactana goes a step further by allowing you to see headlines that are not popular based on social shares alone, but also based on views, backlinks, comments, and other metrics (based on the type of content). This can give you a strong idea of what headlines and content generate the most social buzz, search authority, traffic, and audience engagement. While social media advertising is not free, AB testing for some social media ad platforms is because it’s built right in. Take Facebook, for example. 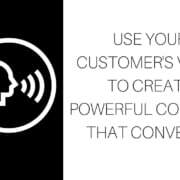 You can create an Ad Campaign, an Ad Set that is targeted to a specific audience through specific placements, and multiple Ads under that set that help you test variations so you can determine which one drives the most conversions. 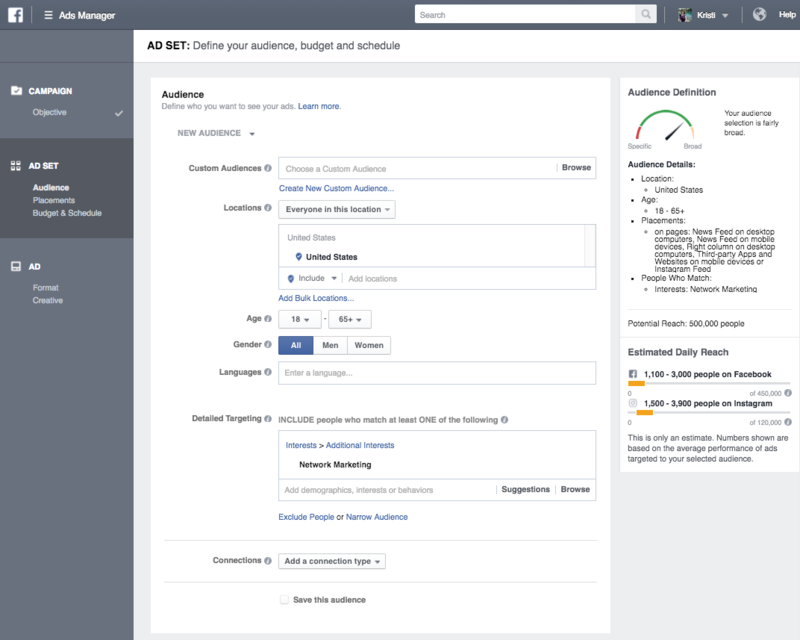 Here’s how the process looks in the standard Facebook Ads Manager. First, you will start by choosing your ad objective. Then you will name your Ad Campaign. 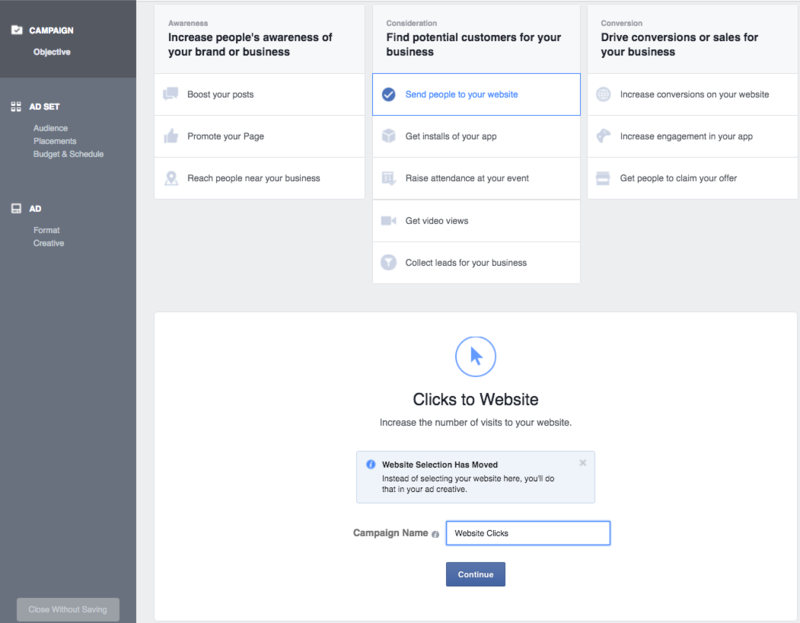 Next, you will define your Ad Set by choosing your target audience, ad placements (the desktop news feed, the mobile news feed, Instagram, etc. ), and setting your budget. Before you continue, you can save the name of your Ad Set. Finally, you will configure your first Ad. Once you’re finished with your first ad creative, you will place your order. Once you do, that ad will go into review and you will get the option to create a similar ad. 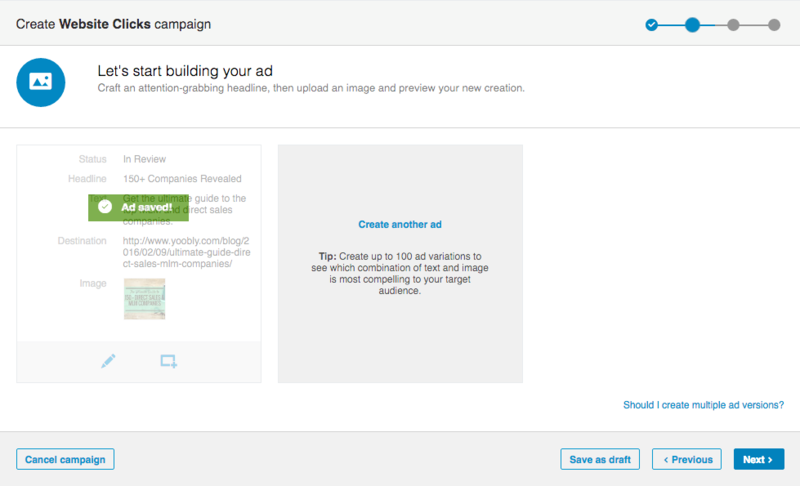 This will allow you to create another Ad under the same Ad Campaign and Ad Set. You will get the option to modify the Ad Set if needed. Otherwise, you can click Continue to create your next Ad variation. This will bring up the same Ad you created before so you can create your variation by changing one specific element, such as the image, originating page, the headline, the text, the call to action, the news feed description, or the display link. Once you have made your variation and placed your order, you will again get the option to create a similar ad or to continue to your Ads Manager. You can also decide to add more variations from the Ads Manager by clicking on the Create Similar Ad button. The downside, as you can see above, is that you can’t name the individual ad variations. Therefore, unless you’ve changed the images between them, they all look the same in the Ad Manager view. Hence, to know which variation in terms of originating page, the headline, the text, the call to action, the news feed description, or the display link is working, you will have to click through to the winning variation and view the post to learn from it. The upside, however, is you can easily toggle off the losing variation of your ad based on its performance. 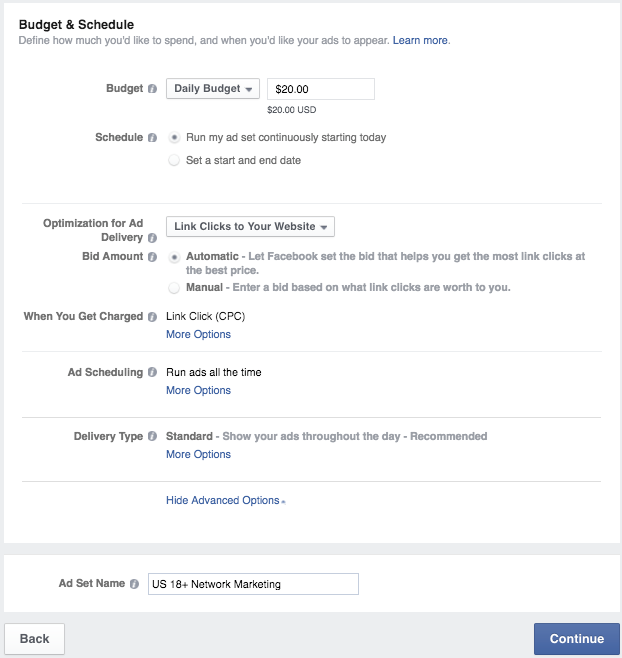 But overall, this is a great way to use AB testing in your Facebook Ad Campaigns. And it’s the simplest way as it doesn’t require you to use Power Editor, although if you are more comfortable in Power Editor, it can be done there as well. 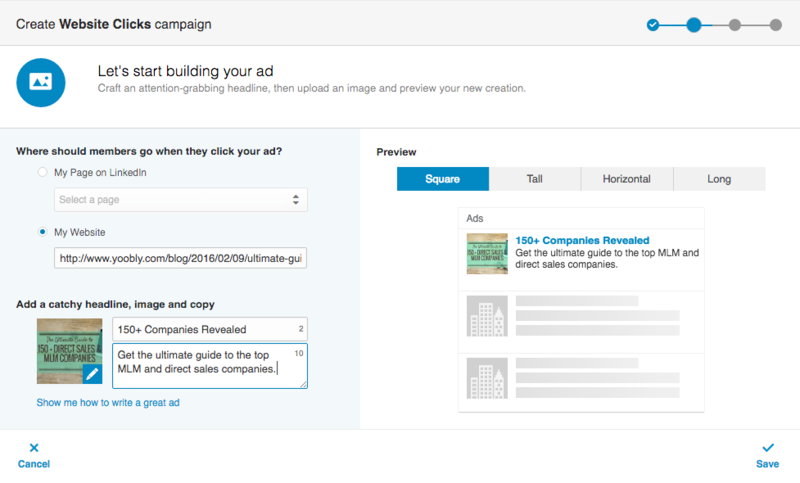 If you use LinkedIn Ads, they also offer an option for creating variations with their text and image ads. Fortunately, their variations editor is even simpler. 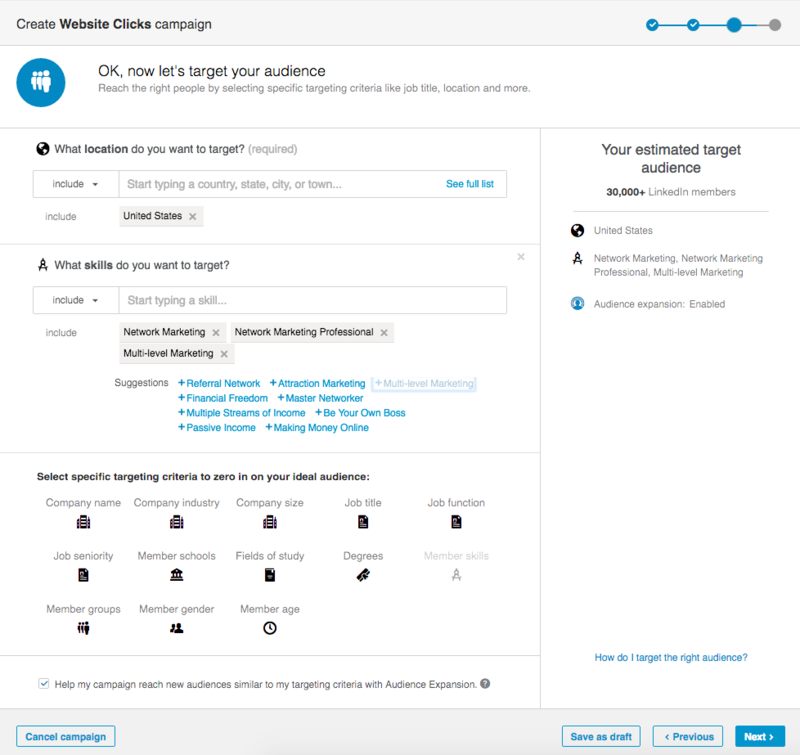 Start by going to LinkedIn Ads Manager, select your LinkedIn advertising account, create a new Campaign, and then select Text Ads. Start by giving your campaign a name. Next, you will create your first ad. 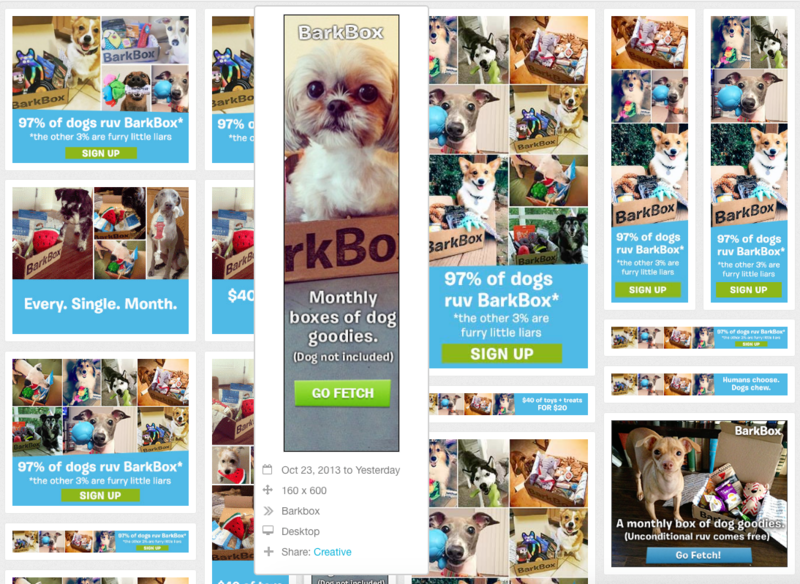 When you save your first ad, you will get the option to continue or create up to 100 variations of your ad. When you click to create another ad, you will be able to create an entirely new ad from scratch to test different URLs, headlines, descriptions, and images. Once you are finished creating your variations, you will continue through the campaign creation process to select your target ad audience and set your ad campaign budget. 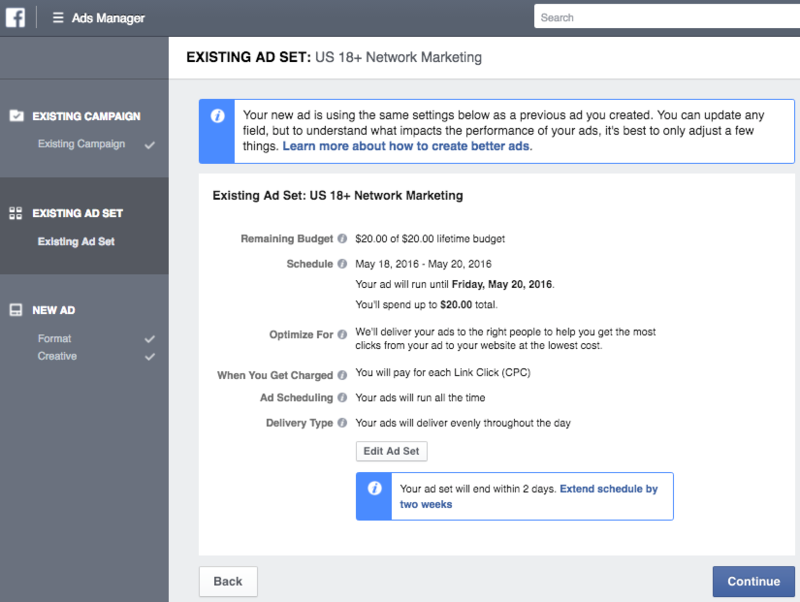 Once you have finished creating your campaign, you will get a clear view in your ads dashboard of how each of your ad variations are performing. This will allow you to learn what works and what doesn’t quickly, as well as allow you to toggle the losing variations off. There are two free alternatives when researching paid advertisements. The first is Moat. Moat allows you to look at other companies display banner ads. While this isn’t specific to social media ads, it can help you learn about the images and ad copy that big brands use to drive paid traffic to their websites. If you notice particular imagery, copy, calls to action, button colors, or other elements have been used over and over again, you can assume that said elements have been doing well, considering you can almost guarantee big brands are testing the elements that they are paying for. 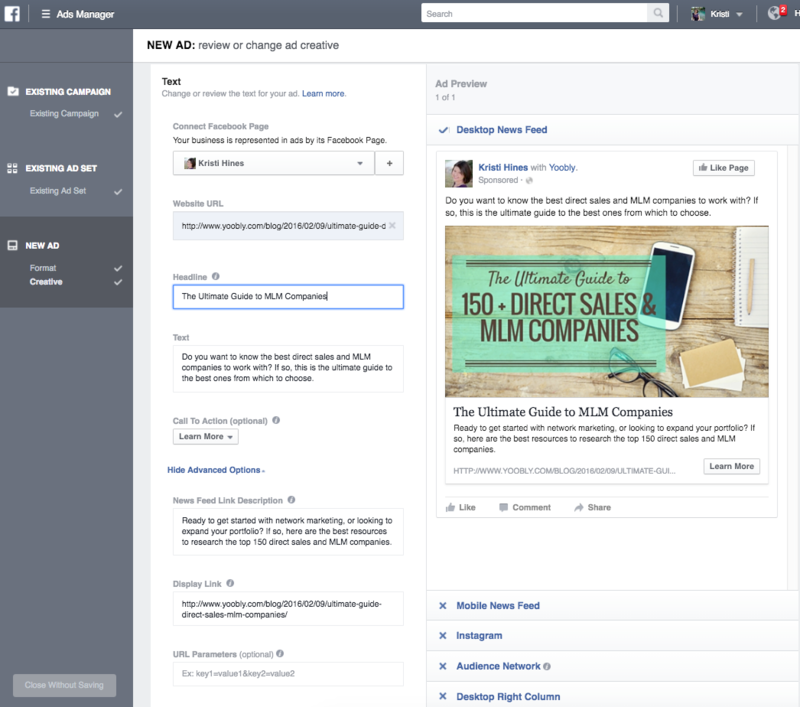 The second resource you can tap into that is specific to Facebook is the AdSpresso Facebook Ads Gallery. 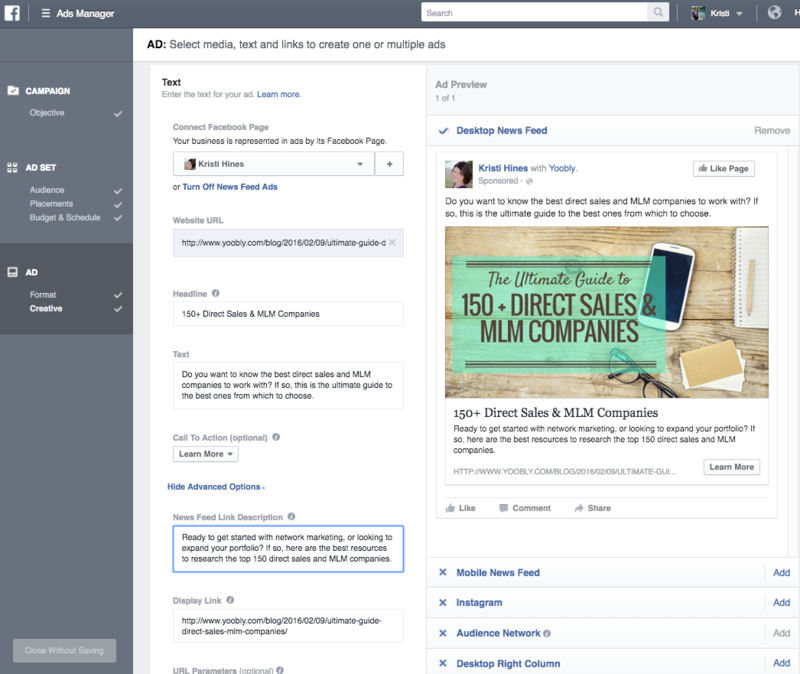 Simply sign up for their newsletter and start searching for brands that advertise on Facebook. Not only will you get to see the variations of ads they have used over time, but you can click on their ads to get some pretty good details about the ads. Between these two resources, you should learn a lot about how to create a successful ad campaign on social media and beyond. And they’re both better options than sitting around and refreshing your Facebook or LinkedIn news feed, hoping to see some ads from your competitors. As you can see, between free and premium tools, there are various ways to A/B test many aspects of your online marketing beyond just your landing pages. Be sure to look at the different aspects of your online marketing strategy and think about the ways you should be testing it to improve your results today! 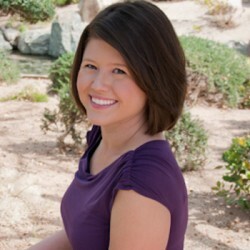 Kristi Hines is a freelance writer, blogger, and social media enthusiast. You can follow her latest tweets about business and marketing @kikolani or posts on Facebook @kristihinespage to stay informed. Kristi Hines is a freelance blogger, and social media enthusiast. You can follow her latest tweets about business and marketing @kikolani or posts on Facebook @kristihinespage to stay informed. Thanks for showing some of the alternatives to AB testing. I use Thrive leads to do this but I know a few people that would benefit from the free tools you mentioned. This is a wonderful article – very helpful, very tactical. For topic & content research, may I request you to also try epicbeat.epictions.com. If you’re interested, I would love to give you a demo and get your valuable feedback.